Today we're going to take a detour from our usually scheduled program of luxury travel and explore some of the United States most treasured destinations - it's National Parks. This is an area I'm new to; even though I grew up in California, I had never even been to Yosemite, much less planned a legitimate vacation to a National Park, so I experienced quite the learning curve. Let me start off by saying that the Yellowstone and Grand Teton parks blew me away, I simply couldn't get enough of the gorgeous scenery and abundance of wildlife; it was incredible and I would absolutely go back during this time of year again. However, spring brings some unique challenges that are important to take note of in your planning so that you don't end up with disappointment and frustration. In this post I am going to give you advice for visiting The Grand Tetons and Yellowstone in the spring, a general overview of the seasonal calendar along with my best learned travel tips through my own mistakes and misfortune for first timers visiting these majestic National Parks. Oh, and I'll throw in some pretty pictures, just in case you really don't care about any of the details. 1. Shoulder Season: April through Mid May is considered the shoulder season based on the Yellowstone and Grand Teton season calendar - meaning it's not really winter and it doesn't feel like spring yet. Weather is unpredictable so most places within the parks are closed, making it even more difficult to plan and get around. You can still have an amazing trip to the national parks, you just have to plan wisely and be willing to be flexible. 2. Road Closures: Nearly all driving roads into both Yellowstone and Grand Teton are closed until mid April and even then it's limited. You can definitely still get in and around the parks and enough to get a great taste for what's out there, but don't be surprised when you encounter major road closures throughout more than half the parks. Be sure to check the official park websites for road closures before you travel: Yellowstone & Grand Teton. But like I said, we visited Grand Teton April 8 and Yellowstone the opening weekend of the West Entrance April 16th and had an unforgettable time, despite the road blocks. 3. Snowmobiling: Once roads do open sometime in mid April, snowmobile season is over within the national parks, even if there's snow on the ground. So if this is something you had planned, you'll want to visit before the end of March for your best chances. 4. 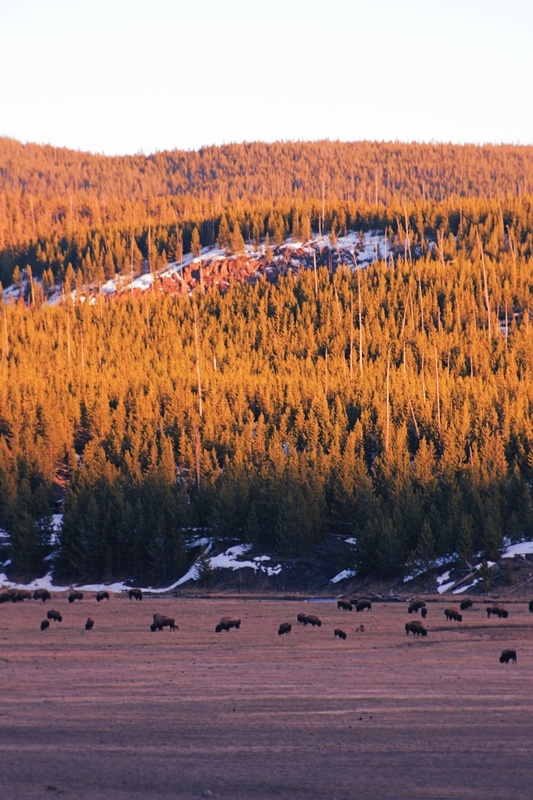 There are NO Crowds: This is hands down the #1 reason to visit Yellowstone and Grand Teton National Parks in spring. During our visits, we would go miles and at times hours without seeing anyone else. When there was something to see like a bear or wolf, at most there was a crowd of 3-5 cars. We were told that roughly 4 million visitors come through the parks each year and 3 million visit from June to August and in general it's a packed madhouse. Unless you like rolling through parks like you're in gridlocked traffic on the 405, I suggest visiting in May or October which is when I'm going back. 5. Pack for All Weather: Spring is very uncertain and you really never know what weather you're going to get. Snow boots are a great idea if you plan on doing any hiking as well as a rain jacket and layers. Temperatures can vary from day to day, hour to hour, so plan for everything. 6. Dawn and Dusk are the Best Times for Photos and for Seeing Wildlife: If you really want to see some of those harder to spot animals like bears and wolves, get up early and drive to some of the hot spots in each park like Lamar Valley in Yellowstone and Mormon Row just outside Grand Teton. Remember your binoculars though because they may be farther away than you expect. 7. Old Faithful is Overrated: I'm not saying you shouldn't see it, it just doesn't hold a candle to the rest of the park - it's touristy, crowded and super commercialized. I suggest leaving it towards the end of your day through Yellowstone and be sure to check times online so you don't end up sitting in the cold for 40 minutes waiting for the next eruption. Do take the short walk behind Old Faithful, it's an easy stroll through colorful geothermic activity. 8. The Road Connecting Grand Teton and Yellowstone is Closed: If you thought you'd drive directly up through both parks, think again. The connection point is usually closed until sometime in May. The best way to get from one to the other is to drive around the west side, it just takes a bit longer. 9. Most Lodges Don't Open Until Mid May: Nearly all of the hotels within the parks are completely closed, even the ones that were open during the winter. The best options I found just outside the park entrances include Dornan's Spur Ranch Log Cabins at the Moose entrance of the Grand Teton and The Explorer Cabins at West Yellowstone. Both were excellent, spacious and within a very short distance from the park entrances. 10. You Don't Need 4 Wheel Drive: This was one thing I was worried about when driving through the parks since snow was a major possibility and we were renting a minivan. We had absolutely no problem getting around, driving all the way from Boise to Grand Teton to Montana to Yellowstone. Of course if snow is really heavy you could need chains, but all of the main roads were well paved so unless you plan on going off roading, you shouldn't have any problems driving to and through these national parks. 11. Pack a Picnic: Ok, I know I said there would be 10 tips, but this one was important and it's my blog so that means I get to do what I want. You won't find any places to eat within the parks unless you end up at one of the open entrances so I highly suggest packing a lunch. Getting through the parks takes a lot longer than you expect with all of the stops and slow driving so it's best to have food with so you aren't having to backtrack just to get to a McDonalds.